Breathing is the easiest tool to self healing. Not only it is free, but can be done anywhere and anytime. One may think that this is yoga mumbo jumbo but the healing breath I am discussing now is not just your usual inhale and exhale. I assure you that you do not have to be a yoga fan to learn this. What a lot of people do not realise is that they do not really know how to breathe. The effects of conscious correct breathing technique is scientifically proven and one can see the results immediately. 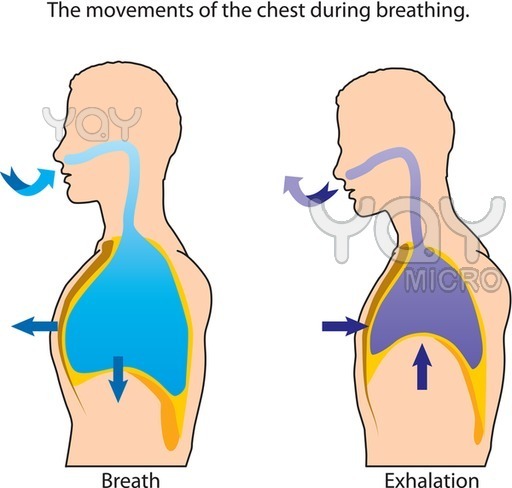 Some of you may have realised that different emotions or activities result in different breathing patterns. Hence the realisation that the breath and emotions are interrelated. For instance, when a person is nervous, stressed or angry,they will unwillingly tense and contract their body, resulting in shallow or short quick breaths and a quicker heart rate. Similarly, a person doing cardio exercises, after a while, will also automatically revert to short quick breaths. On the other hand, when one feels happy or relieved, a big inhalation and exhalation will be taken causing the body to relax. Hence there is truth when someone tells you in times of stress to “take a deep breath”!! I have conducted short workshops for corporate groups with people who are highly successful in their line of job and living in big cities. Not surprisingly 80% of them, especially men find the thought of focusing on their breath difficult. Most of us forget that our breath is the giver of life and it affects our mind and body in all ways. To add on to that, most people are ‘chest breathers’ which means that they are not breathing fully into their lungs and hence insufficient amount of oxygen will go through their body. I always start with allowing the participants to learn to focus on their breath. Then I go on to teach them deep breathing, which they will find very unnatural. The expansion of the rib cage and hence the chest plus the activation of intercostal muscles is strenuous for their upper body. But after a few days, there will always be enjoyment in their faces at the end of their breathing sessions. They then take home with them a better breathing technique and consciousness which is extremely important. Here are the deep breathing or full yogic breathing instructions which I hope all readers will practice everyday and finally find it natural to do. For teaching and practice purposes, there will be 3 parts of the body which we will focus on, the belly, chest and neck. To start with, it will be easier to lay down with your knees bent. Inhale slowly through your nose and ‘into the belly’(note that it does not literally go into the belly), expanding the belly, feeling the hand lifting and keeping the chest still. Emphasising abdominal movement while keeping the chest or rib cage immobile helps to engage the diaphragm. The diaphragm muscles in turn contracts and this will cause the diaphragmatic muscular walls to pull the dome down towards the base of the rib cage, pushing the fluids and organs in the abdominal cavity, causing the belly to expand sideways, forward and backwards, exactly like air going into a balloon. There goes the full yogic breathing!! So start with the 1st and gradually move on to the 2nd and 3rd depending on your progress. When the full yogic breath can successfully be done, be mindful of the lift in the spine. A proper breathing ensures good posture because you cannot possibly slouch when your belly and rib cage have been fully expanded. Another tip to note is that this breathing can be adopted during cardio exercises. It has a calming effect and helps to control the heart from beating too fast, promoting a healthy heart.